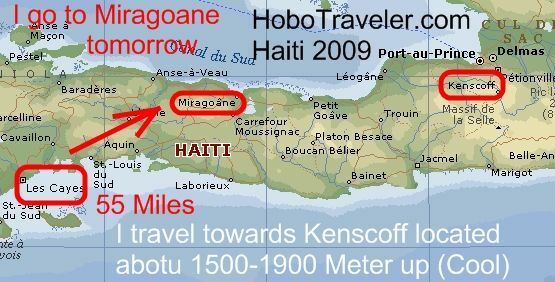 I leave Les Cayes tomorrow morning, my target destination is Miragoene, Haiti. It is only 55 miles away, probably will take two hours in a Tap Tap. I need to go in stages, ever ready to retreat. The Lonely Planet travel writer although excellent in collecting information, somehow failed to find any Backpacker priced Hotels. He is consistently coming in over 40 dollars, and averaging about 60, he calls 30-50 budget. He is really good, but just never seems to travel or think on a shoestring. I will go to Miragoene, look for a room, if I find one less than say 700 Gourde, I will stay. If I do not find an on-budget hotel, I can continue on or retreat back to Les Cayes and the Patience Hotel for 500 Gourde. I have to re-write the Sleeping part of the Lonely Planet as I go, these prices are nutty. 40 Gourde equals 1 U.S. Dollar. 500 Gourde for a Backpacker is expensive, I am already double what a die-hard traveler could bear to pay, I feel like I am violating the rules of the road. If you say that, then truly you do not have a travel budget. I would feel like one of the rich get richer and the poor get poor people if I paid 40 dollars for a room in Haiti. That is one months pay for a lot of folks here.